Did you catch my Michael’s Dream Tree Reveal on the 1st? Hopefully you did! 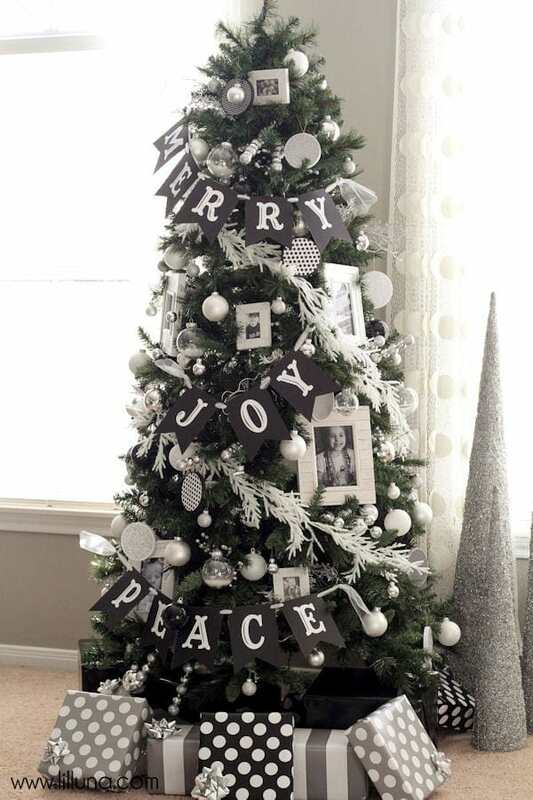 This year I decided to do a more neutral tree and went with Black, White and Silver for the colors. I don’t normally pick neutral colors just because I’m slightly obsessed with bright colors, but I LOVE how it ended up turning out. It’s beautiful and looks perfect in my family room which already has lots of grays, white and black. Last year I did my bright Advent Tree and wanted to change things up this year, which is why I chose this color scheme. It was totally different and I wanted to make it a bit more sentimental. To do that I decided to pick a few of my favorite holiday words and make paper banners out of them. I also decided to add some of my FAVORITE pictures of my kids from 2014. I printed them in Black and White and put them in frames from Michael’s. They are (by far) my favorite part of the tree. Looking at the pictures make me smile, and since they’re my favorites from this year how could I NOT smile?! For example, the picture below is one of my Evie (aka Shmertz). She’s covered in jewelry from head to toe, which is a common occurrence here in our room, and it shows so much of her personality. I LOVE it!! 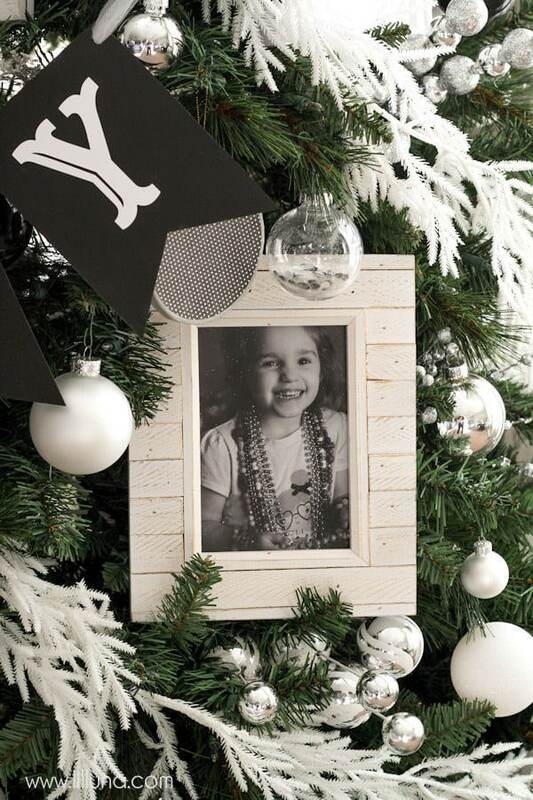 These frames adorn the whole tree and give it a great sentimental touch! 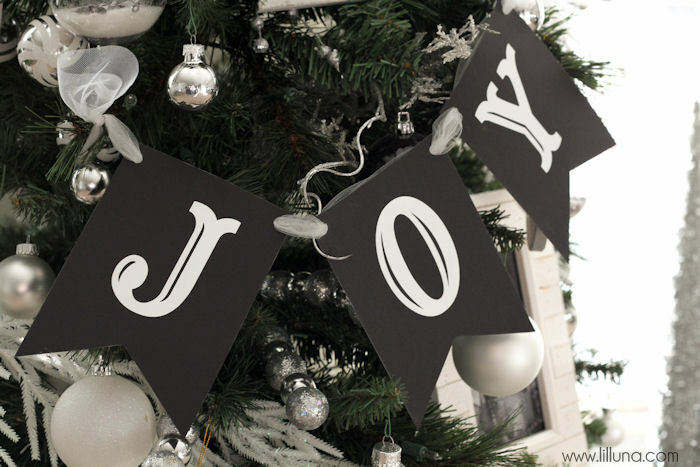 The banners also do the same thing and although they are black and white, they add the perfect festive touches. I also threw in a few handmade ornaments and filled glitter and scrapbook circles in these clear ornaments as well as scrapbook paper and paint onto these paper mache ornaments. They gave the tree the perfect touches I was looking for. 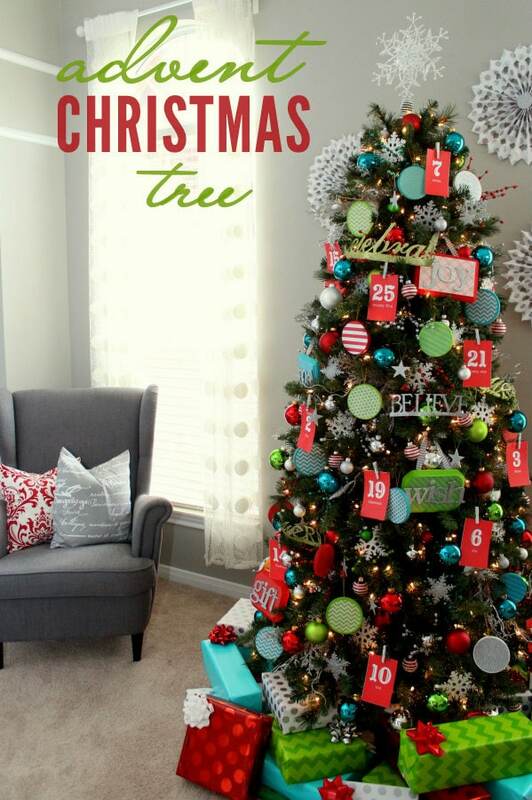 I love how it turned out and wanted to share a few tips with you on how YOU can decorate your Christmas tree! Think of a theme or style that fits YOU and YOUR HOME. Begin decorating your tree by using the fillers. 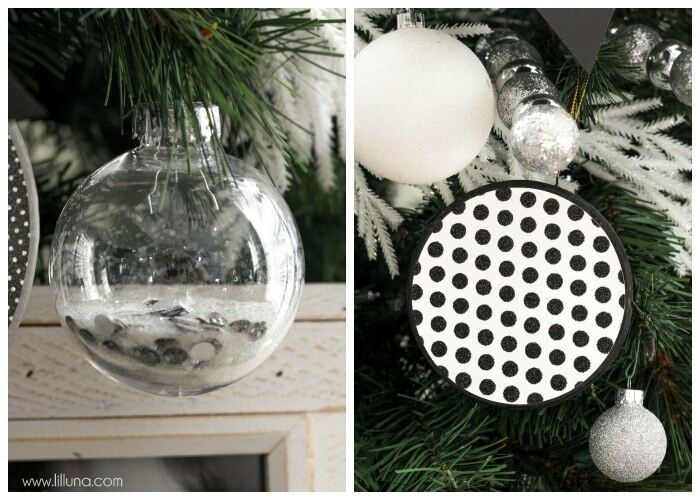 Then add ornament balls in your matching colors. 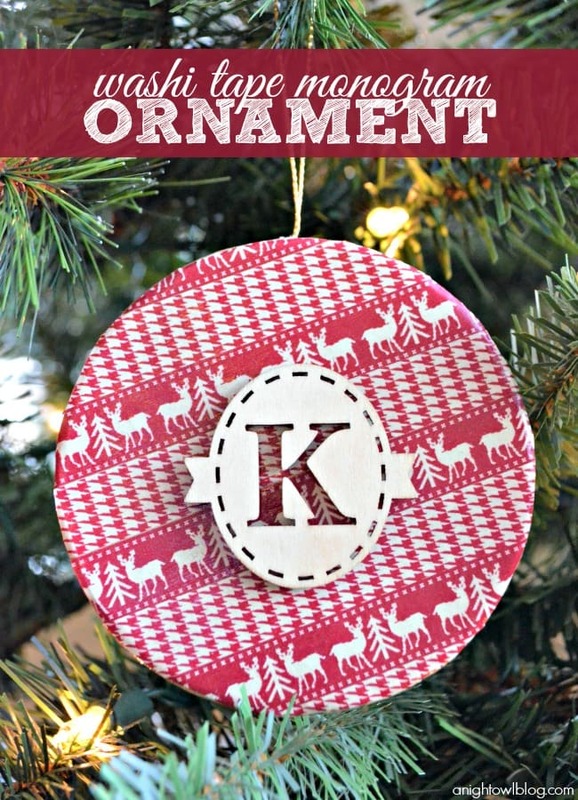 Save your favorite ornaments for the end so that they can be seen more easily and aren’t buried under some of the other ornaments. All Michaels stores are hosting a Holiday Pinterest Party tomorrow, Saturday Nov. 15 from 1-4pm – come in and create a fun holiday project with the help of a Michaels associate! I hope you have fun decorating your Christmas tree in the following weeks, and can use some of the tips I suggested. For all Christmas ideas here on the site go HERE. Thanks for the great ideas! 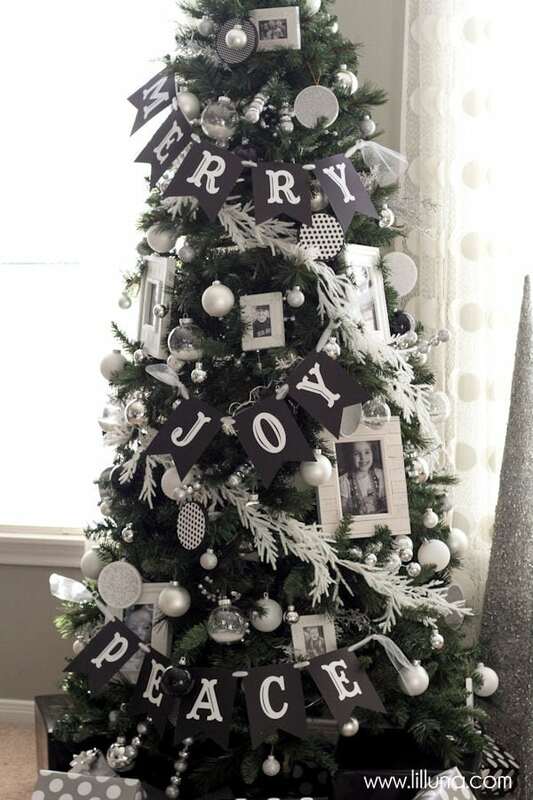 I try to decorate my tree differently every year, and these tips will definitely help! This is such a pretty tree! Do you have a tutorial for the banners? I just found your blog and think it’s wonderful so I signed up for your newsletter. I was wondering; where did you get those wonderful looking photo frames. I’m in the process now of making family photo ornaments for our 2015 tree. With 2 grown daughters and 9 grandchildren I have many ornaments to make as I’m going back in the years and using baby photos up to the present so going to be busy making photo ornaments for the months to come.